House & Garden Drip Clean is an amazing new product like no other on the market. It is designed to reduce the need for flushing the plants media. Drip clean contains potassium and phosphorous compounds, two very powerful and useful elements required for maximum growth by the plant. Drip Clean also ensures that no blockages develop within your hydroponic feed system, requiring less maintenance and increasing efficiency. House & Garden Drip Clean is so unique that most growers haven’t even heard of this type of additive. The function of this product is extremely unique and the results are impressive. Drip Clean contains potassium and phosphors, these two compounds have had their chemical molecules changed to remove one of their structures. This makes the molecule into a kind of magnet, as molecules always try to complete themselves. Drip Clean will keep your medium at an optimal EC-TDS level, as it will remove salt build-up, reducing the number of flushes required. Plants perform at they’re best when provided with a stable root zone. Therefore, the benefits of flushing must not be ignored. However, while relieving your plants media of unwanted and potentially toxic salt, you are also exposing the plant to shock and stress. Flushing on the root zone is essentially resetting the media’s balance and then rapidly replacing it, leaving the roots in a temporary state of confusion. 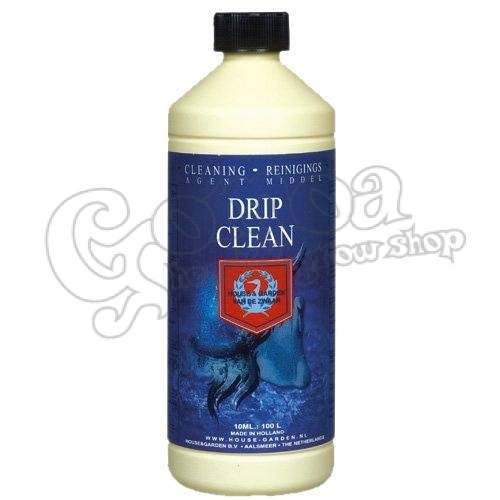 The fine balance of residue removal and root environment stability are achieved only with the addition of Drip Clean. House & Garden Drip Clean should be added to any system to ensure superior root zone stability while providing maximum growth and flavour. You’ll love this, 0.1mL / 1litre of water is all that is required. House & Garden drip clean works to prevent blockages and clogging within your hydroponic feed system.